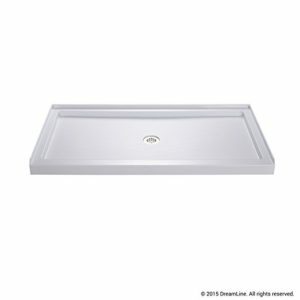 Last Updated: March 25th 2019 A shower pan is the base of your shower unit. It’s one of the most important aspects of your shower unit both for the look and efficiency of your bathroom. The underlying surface of the shower pan is made of sloped concrete. The water is collected in the pan and funneled down the slopes into the drain. Having the best shower pan can be the difference between a costly repair and a consistently running shower. 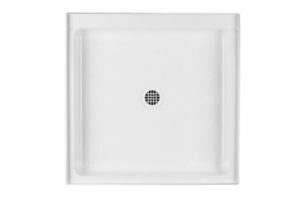 Having the right shower pan in your bathroom is important so you have the correct drainage. If your shower doesn’t drain correctly it’ll cause flooding and water damage to your floor. As well as working correctly it needs to fit into your available space within the existing shower unit. The space you have will dictate which shower pan you can buy, but most can fit into a range of different spaces. Finally you need to consider the style and look of your bathroom and shower. You’ll need to choose a shower pan that fits your existing decoration and doesn’t look out of place in your home. If you have just taken a look at our shower faucets or shower valves page and you want the best shower possible, then you need to get the best shower pan as well! There’s a lot to consider when buying your shower pan and there are a fair few options out there. 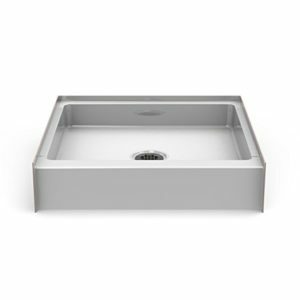 Along with this, there are also similar pans that fit bathtubs including Sterling Vikrell bathtubs and shower enclosures like the Vigo shower enclosure. We’ve identified our top three for your home which are easily available online. Let’s check them out. Dreamline are known for producing high quality shower and bathroom appliances and fixtures that are suitable for any home. They believe in creating smart and visionary designs which give the user affordable luxury in their home. 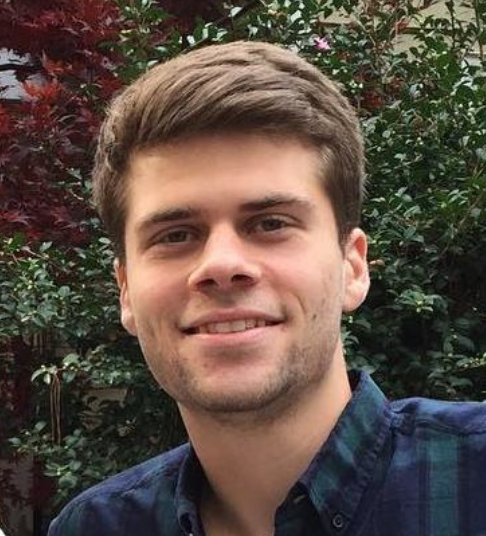 Passionate about customer experience they’ve developed a range of products with the purpose of giving practical solutions to their customer’s problems. They now have a diverse product selection, including a collection of shower bases. The shower pan is rectangular, weighing 46 pounds and is built 36 x 60 x 2.8 inches. All of these features make the Dreamline Slimline Shower Base one of the most useful and well made on the market. It’s heavy duty, reliable and easy to fit and suitable for most homes. 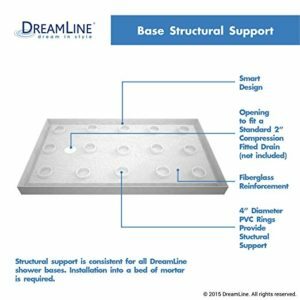 The feedback from customers about the Dreamline shower base has been generally very positive. “This has been an excellent product. Have been using it for between 2 and 3 years. Love the very low threshold.” - Brad M.
User reviews all tend to agree that the shower pan works well and is a stylish addition to the bathroom. There have been isolated reports of warping in the product. These seem rare and don’t indicate a systematic problem with the product, but it’s something you should look out for when unpackaging your product. Overall the feedback is positive and users seem happy with the quality and durability of the shower pan. The Dreamline Slimline Shower Base is one of the most affordable shower pans on the market, giving the feeling of quality at a low price. This makes it a great addition to your bathroom and can add value to your home. Well built with the potential to last a long time, definitely one to consider for your bathroom. Swanstone offer American made surfacing solutions for bathrooms and kitchens. They have over 50 years of experience in the industry and from their humble beginnings now host a varied product range in their online store. Behind Swanstone is their dedication to superior quality. They believe in creating innovative, but affordable, products that are beneficial to the customer. With a long history and a great selection of products Swanstone have made themselves one of the best companies in this market and shown themselves reliable shower pan manufacturers. The Swanstone shower floor comes with a white finish for a clean look. It’s made from veritek, this means there is no surface coating to crack or damage. It’s also non porous so there won’t be any mold or mildew damage. The Swanstone shower floor is a solid and well made unit. It offers useful features which make it one of the popular choices out there. It has a decent weight to it at 32 pounds, making it a sturdier and more reliable piece. “Easier to install then the PDF's make it to be. Heavier material then what I was expecting for the money. this by far is one of the best shower pans I have ever purchased.” - Napo M.
Users know that this is one of the more affordable brands and as such they don’t expect quite as much. That being said the user feedback seems to indicate that there is a lot of satisfaction with the purchase and it’s doing a good job in people’s homes. The Swanstone shower floor is one of the more basic on the list. It’s a fairly simple design with useful features but what separates it from a lot of the crowd is the quality. Swanstone know how to make great surfaces for bathrooms and you can trust in their shower pan. The other way in which Swanstone have separated themselves is in their price and this is one of the most affordable shower pans out there. The combination of quality and price makes this one to consider. KOHLER are a well known designer and producer of bathrooms. They’re renowned for their style, quality and variety which they bring to your home. Operating since 1873 they have one of the longest histories around. In that time they’re built up a strong range of products. KOHLER believe in promoting the concept of gracious living. Through charm, good taste and generosity their products help contribute to giving you a higher level of gracious living. KOHLER have the experience and know how to make great products. They have shown themselves to be an outstanding performer in this industry and are a good choice for any bathroom products. The KOHLER purist shower receptor is available in over 10 different colours. The most popular is of course white, but it allows you to match it to your specific colour scheme in your bathroom. The KOHLER shower receptor is built a little bigger, 50.4 x 38.5 x 9.4 inches, and weighs 180.8 pounds. It’s a heavier weight but a more durable product that’s been made to last. 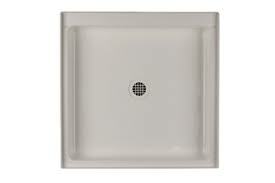 KOHLER are known for their quality and their shower receptor is a great example of this. Durable, stylish quality is what you get with their shower pan. “Strong, beautiful shower pan. We have remodeled many bathrooms in our day and opted to go with this one because we want it to be our last’ - Stan B. Users are quick to comment on the solid and durable nature of the product, which means less work for them. The only downside is that the weight can make it more difficult to install for some less able individuals. If this is the case be sure to consult some professional fitters and don’t risk injury. “Yes, it's pricey relative to other shower base solutions but it will last forever without a leak. There is no ongoing maintenance, unlike tile shower bases.” - Andy E.
The KOHLER shower receptor is probably the best quality shower pan on our shortlist, and it’s no surprise seeing as it’s KOHLER. The materials and features make it a lot more reliable than others on the market, with far fewer long term issues or ongoing maintenance for the customer. I personally own this shower pan with my Grohe Rainshower faucet. The main downside of course is the price. It’s a more expensive product and KOHLER are one of the higher end manufacturers for shower pans. However in all home furnishings you often get what you pay for, and users seem pleased to have forked out more to purchase this shower base. If it fits your budget then the KOHLER shower receptor is definitely one to consider. The long term savings in time and money will mean it pays for itself. Another base here on our list is a unique step in shower base by Barrier Free. If you are someone that is concerned about water spilling on your floor, then having a step in shower is a great option for you. 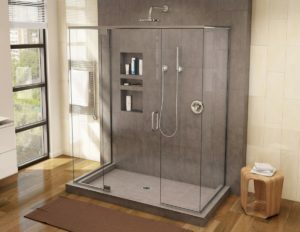 A step in shower is a shower base that has an elevated lip or wall that you have to physically step over to enter the shower. Generally these walls range from at least 4 inches to up to about 8 inches. 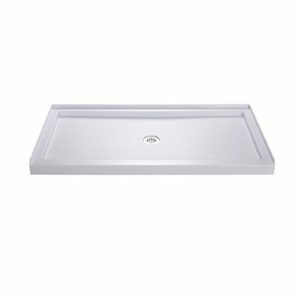 This Barrier Free shower base is 30 inches wide by 30 inches long which makes it a perfect square of decent size for your bathroom. Along with this, this base has a wall height of 6 inches which makes it great for keeping water in the shower and off of your floors, while still making it easy and natural to enter and exit. Along with this, this product features anti scratch and slip resistant coatings for your safety. This fiberglass pan is featured with a gelcoat for added durability and anti slip. Overall this is a great base for those who need to keep the water in their shower, but still want to easily and naturally be able to step into their shower. This product is extremely durable and built with anti slip texture that makes it a great base for any showerer. Along with this, the installation of this shower uses a 3-wall alcove which makes the installation extremely easy, and attaching to the flange is no problem at all. Overall, this is a great shower base, and I suggest it to anyone that wants a step in shower! There’s a fair amount to consider when it comes to buying a shower pan, but there is also a lot of similarity on the market. We’ve selected these three because of the value they bring to the user in terms of affordability, quality or a combination of both. We’ve chosen three reliable manufacturers who we know will deliver some consistent quality to your home. The specific products are for varying budgets but if you can afford the KOHLER then you should check it out today. Anything plumbing related can often be a daunting task, especially when it involves showers. That being said, it is no small task to install a shower base or pan, but it is a do-able task if you have the right tools and the right persistence. Test the Size of the Pan/Base: Before you start caulking and physically attaching anything, you want to place your base down and make sure the size fits, and everything looks good to you. Also make sure the drain opening is above the opening on the floor. Attached Flange and Drain Opening Together: Make sure the flange fits flush with the outer lip of the drain opening, you can always add extensions if needed. Use cement and primer to attach the flange to the drain pipe, following manufactures instructions, and let dry. After it is dried, attach the gaskets between the flange and the bottom of the pan. Set the Pan/Base in Place: Now that the drain pipe is taken care of, you can set the pan in place over the drain pipe and make sure everything is in correct position. Caulk and Secure Base: Now that everything is in place, it's time to attach everything together. Use silicon to caulk the drain flange. Line up the screws with the drain body and the flange body, and secure them. Securing the Side Panels of the Base: Now that the middle of the base is secured it's time to drill the sides securely to the wall. Follow the predesigned drill holes and drill your base to your wall. Overall installation can be a little daunting, but it can definitely be completed in an afternoon or a weekend. That being said, it's recommend that you get an inspectional after you install to make sure there aren't any leaks you have to worry about. Overall any of these three will be a great addition to your bathroom, but if you’re not convinced then check out the other products in their collections. They’re all readily available through Amazon and other sellers so you can upgrade your shower today. If you are interested in other shower products I suggest you take a look at our shower squeegee reviews page.